If you are unsure as to what ribbon your typewriter requires after checking the guide found below, just send us the make and model of your machine, and we will get back to you within a few hours! Note: By default, you will receive a black & red ribbon, however we can provide all-black ribbon upon request. 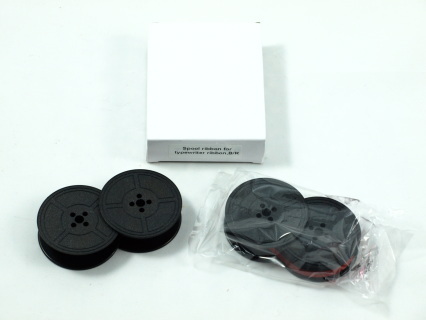 Check this quick guide to see if our universal ribbons will work with your typewriter or not. Everything on this list has been confirmed by Typewriters 101. ​If your typewriter is not on this list, contact me! Pretty much everything SMC that isn't extremely small and slim. Note: Remington models such as: Remington Travel-Riter, Letter-Riter, Quiet-Riter, Miracle-Tab, Ten-Forty, Model 1, Mark II, Noiseless portable models, and a few others do not have interchangeable spools, so the ribbon must be thread directly into the typewriter's built in spools. For that procedure, go to this page and scroll down until you see: "How to change the ribbon on Remington typewriters without interchangeable spools." ​Universal ribbons can be purchased for these models, just keep in mind that the spools themselves will not be used; only the ribbon.